Alright, we've got one more for ya. After being introduced to this '80s throwback Dwayne Johnson pillow and this oh-so-alluring Jeff Goldblum pillow, Parks and Recreation fans will be happy to know that Pawnee's own Ron Swanson, aka Duke Silver, is officially available on Etsy for your sequin pillow swiping pleasure - and, look, he's smiling! OK, we can't actually tell because Ron Swanson has the emotional range of a teaspoon, but just imagine the laughs you'd get out of having a Swanson pillow on your couch all the time. Thanks to Etsy user Memeskins, Ron can convey his constant displeasure to you and all of your house guests in red, gold, and rose gold pillow form. If you're looking for a more subdued version to blend in with the rest of your decor, then the Ron Swanson Faces Pillow ($28) might be for you. For Parks and Rec fans with a strong love of whisky and breakfast food, the large-print Ron Swanson Face Pillow ($28) might be more to your liking. 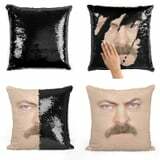 As unsettling and hilarious as these pillows are, I absolutely need one in my life, and in the words of Ron Swanson, "I regret nothing. The end."